Lee Dickson admits featuring in this year’s World Cup would be ‘the icing on the cake’ for his rugby career amid fierce competition for a scrum-half spot in the England camp. The Saints star is one of four scrum-halves in England’s 50-man training squad ahead of the home competition, which starts in September. 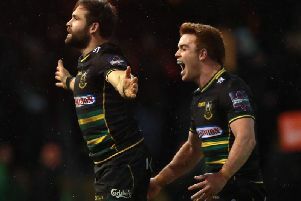 Dickson has enjoyed success domestically since his move from Newcastle Falcons to Saints in 2008; winning the Aviva Premiership for the first time in the club’s history, finishing runners up in the Heineken Cup and lifting the European Challenge Cup twice. And the 30-year-old is currently working tirelessly as he attempts to cement his place as one of three scrum-halves set to be named in the final 31-man squad in August. “Playing in a home World Cup would be surreal,” said Dickson, who was speaking as part of the England Team at the official launch of the Canterbury England Rugby World Cup kit. “It would be the icing on the cake for my career to play in a World Cup and especially in front of a home crowd. “I would be speechless and it would be a proud moment for me and my family. “Words can’t describe what it means to me to pull on that shirt. From the first time to the last time, it is the same feeling; the emotion, the pride for my family and all the people who got me into this position. “I am representing not just my family but the country; this nation. “It is not an individual sport. When you pull that shirt on, you don’t want to let down the person next to you, you don’t want to let yourself down and you don’t want to let your country down. Dickson faces a stiff test for a place in the squad in the form of Leicester’s Ben Youngs – the man to beat after his sterling Six Nations – Harlequins’ Danny Care and Richard Wigglesworth of Saracens. Dickson has gone the longest since featuring for England and has the least caps, with 18, but dismissed the suggestion he had less of a chance to make the final cut. Dickson said: “I think all three places in the squad are up for grabs. Ben has done a good job for England but nothing is set in stone and over the last two years we have all rotated; we have all started, we have been benched and we have all not been involved at all. “It is a vicious circle and we all must do everything we can. For me personally, I will keep putting my hand up and go from there. England coach Stuart Lancaster has been banging the drum for his team to become the fittest in world rugby – and it is something which Dickson believes will favour the scrum-halves currently in camp. He said: “This brand of rugby is perfect for me. That is exactly what I do. “I have really enjoyed the last couple of weeks because it (good fitness and energy) is my forte and I love the running around side of rugby.